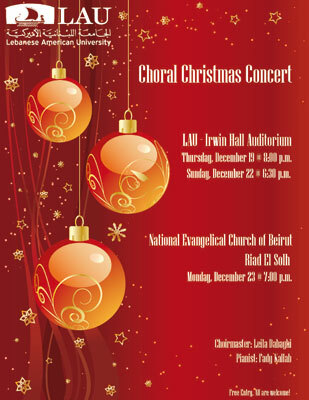 Join LAU for its annual Christmas Choral Concert directed by Leila Dabaghi featuring Fadi Kallab on the piano. On December 19 at 8:30 pm in Irwin Hall Auditorium, Beirut. On December 21 in the National Evangelical Church in Riad el Solh Square. On December 23 in St. Mary’s Greek Orthodox Church in Douma.